Traverse City is hard to beat when the sun is shining over the beaches of West Bay, but on those days when time is best spent indoors there are plenty of Traverse city rainy-day offerings. Here are our top picks for an awesome time on an otherwise dreary day in Traverse City. You may need an umbrella for the outdoor shopping of Traverse City’s Downtown, but a wet day is the perfect excuse to delay in some of Northern Michigan’s best boutiques. Summer is high season for strolling and shopping downtown Traverse City. The heart of the action is the three-block stretch on Front Street between Boardman and Union Streets, home to dozens of boutiques, cafes and restaurants. Lots of clothing and home accessories shops, independent bookstores, boutiques for babies, a toy store, gourmet food purveyors and more. Best of all? 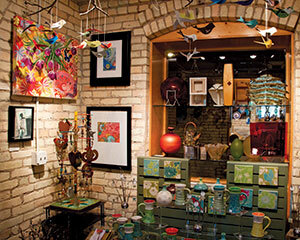 Many of the retailers showcase locally made goods, making it easy to shop Michigan made. Don’t forget to duck down the side-streets and alleys to find off-the-beaten-path shops. 231.922.2050, DOWNTOWNTC.COM. On Front Street between Union and Division is a host of independent businesses. Highlights include a doggie boutique, a gourmet kitchen supply shop, a chocolatier and several specialty grocers with regional wines and fabulous food finds from around the region. 231.922.2050, DOWNTOWNTC.COM. 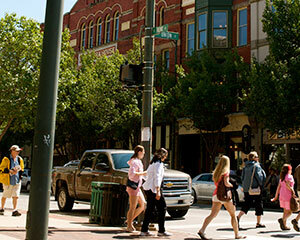 On Union Street a few blocks south of Front Street is TC’s Old Town district, a handsome shopping district where the vibe shifts to more laid-back. Businesses here include galleries, boutiques, home goods stores, salons, a neighborhood grocer (with a renowned butcher counter) and a handful of casual restaurants, like Blue Tractor Cook Shop, where you can dig into burgers, comfort food and a post-shopping brew. 231.922.2050, DOWNTOWNTC.COM. In the 200 block of Garland Street between Front Street and Grandview Parkway, the Warehouse District offers a touch of urban edge in this little city. Formerly home to warehouses and factories, the area has been undergoing a renaissance, with an eclectic variety of shops and eateries moving in to take advantage of the spot’s primo location—just blocks from downtown and steps from the beaches on West Bay. 231.922.2050, DOWNTOWNTC.COM. About three miles south of Traverse City is a host of retailers on South Airport Road, anchored by Grand Traverse Mall (GRANDTRAVERSEMALL.COM) and Cherryland Center (CHERRYLANDCENTER.COM). The Mall is home to more than 100 shops, a food court, a nine-screen cinema and even an antique carousel. Cherryland includes a number of national retailers plus Opa! Coney and Grill, a sweet cafe and coney joint specializing in Greek and Polish food. You don’t have to be an overnight guest at this resort to meander through the Gallery of Shops, a collection of inventive boutiques ranging from a toy store to gourmet foods boutique to a pro shop. New this year is Mud Pie, a store with hip clothing and accessories, gifts, items for baby, and beachy gear for summer living. 231.534.6705, GRANDTRAVERSERESORT.COM. Often Traverse City’s history gets overlooked, but the exhibits at these three local museums show off the rich cultural foundations of the Big City by the Bay. This beautiful museum’s main attraction is its collection of antique musical instruments dating from about 1870 to the 1930s. A walking tour gets you up close to rare nickelodeons, pipe organs, music boxes and other music makers from back in the day. Another highlight: the annual silent film series featuring live accompaniment on the museum’s ornate Wurlitzer theater organ. 7377 U.S. 31 N., Williamsburg, 231.938.9300, MUSICHOUSE.ORG. Poke around local art galleries. No rush if the skies are stormy. This mixed-media gallery and boutique shines the spotlight on one-of-a-kind studio jewelry, but also offers an eclectic variety of other works by artists from all 50 states. Themes here include antiquity, mystery, contemporary/abstract, upcycled pieces and found art. Of special note is Gallery Fifty’s collection of coveted Fordite and Leland Blue Stone jewelry; the former is a swirling “gem” resulting from hardened automotive paint from Ford’s River Rouge factory near Detroit; the latter is slag with a pretty blue hue leftover from Northern Michigan historic iron ore smelters. 800 COTTAGEVIEW DR., SUITE 50, TRAVERSE CITY, 231.932.0775, GALLERYFIFTY.COM. Take a look at an interview with Gallery Fifty owner, Christie Minervini. A fine art gallery attached to Old Mission Tavern on Old Mission Peninsula, focusing on original works by more than 75 local and regional artists. Don’t overlook the adjacent sculpture studio, featuring work by Verna Bartnick, owner of the tavern and gallery. If you’re planning an event, ask about renting the banquet room in the middle of the gallery—a gorgeous spot to host any sort of reception. 17015 CENTER RD., TRAVERSE CITY, 231.223.4142,OLDMISSIONTAVERN.COM. Landscape artists share a space in downtown Traverse City. Walk in, be inspired. 102 S Union St., 231.933.1194. Listen to the rain pit-pattering the windows and sleep in just a little bit longer. Wake up, if only for breakfast, where you can cozy up with a muffin and mug at these four Traverse City eateries. This classic bakery has been a Traverse City favorite for more than eight decades. Doughnuts, Danishes and muffins are a few of the many choices for a grab-and-go breakfast, but the shop’s new location on Hall Street also has a full menu if you’d like to linger. 231.947.5125, POTTERSBAKERY.COM. The main attraction here is the shop’s namesake baked treats: bite-sized versions of brownies, muffins, cookies, cakes and scones. The tiny delights pair perfectly with the shop’s exceptional coffee drinks. 321 E. FRONT ST., 231.421.1353, MORSELSBAKERY.COM. Eurostop’s downtown location makes it a great go-to for nabbing a quick breakfast before a day of shopping Front Street. Take-out choices include breakfast wraps and homemade croissants. 300 E. FRONT ST., 231.421.1168, EUROSTOPCAFE.COM. 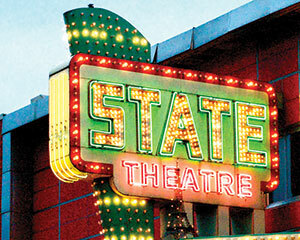 Check out the Traverse City Vacation Guide for more tips about TC!